Every G-Class has to conquer the Schöckl. 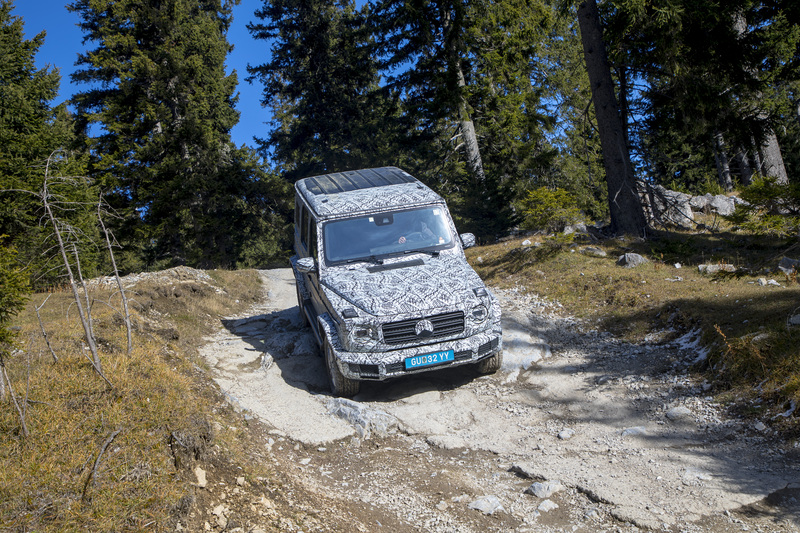 Mercedes-Benz uses the 1,445 meter high local mountain near the Austrian city of Graz as a test track. The 5.6 km route includes gradients of up to 60 percent and lateral inclinations of up to 40 percent. During the development stage, a “G” has to endure over 2,000 strenuous kilometers on this very demanding course. 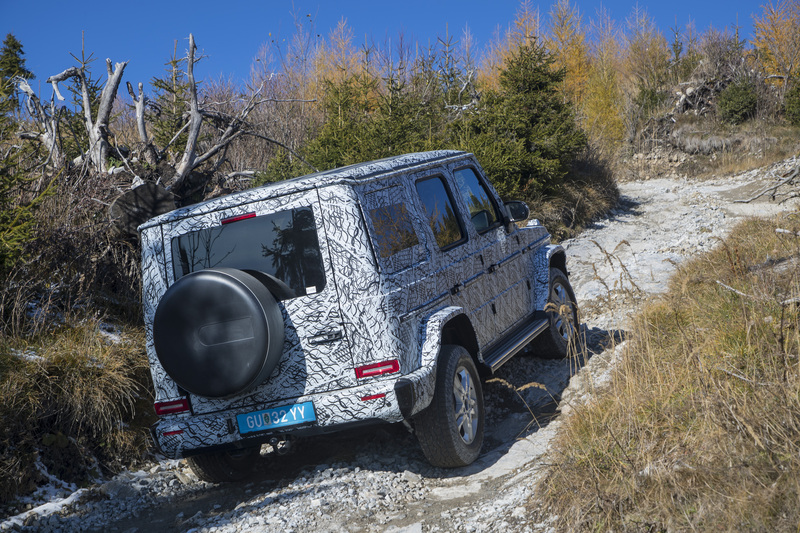 The new G-Class masters the route with noticeably more control and comfort. 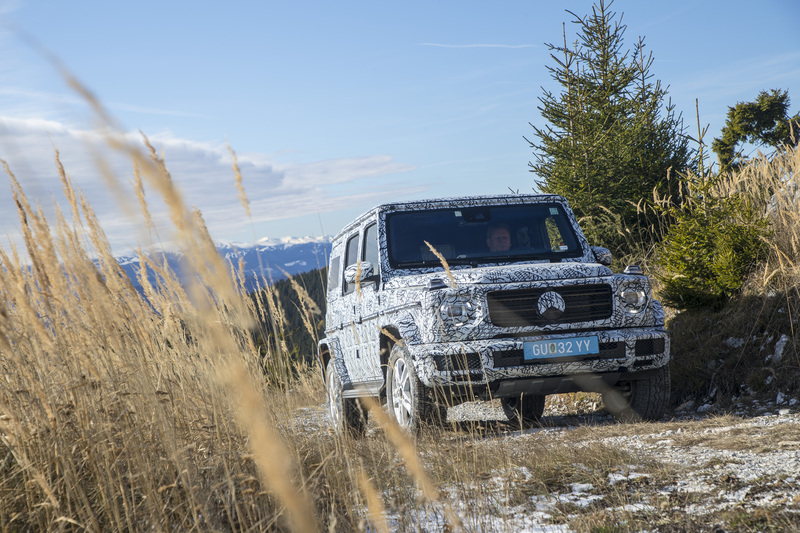 The primary goal of development was to make the new G-Class even more effective off-road. The G thus remains a true G – thanks to its standard ladder- type frame, the three 100-percent differential locks and LOW RANGE off-road ratio. 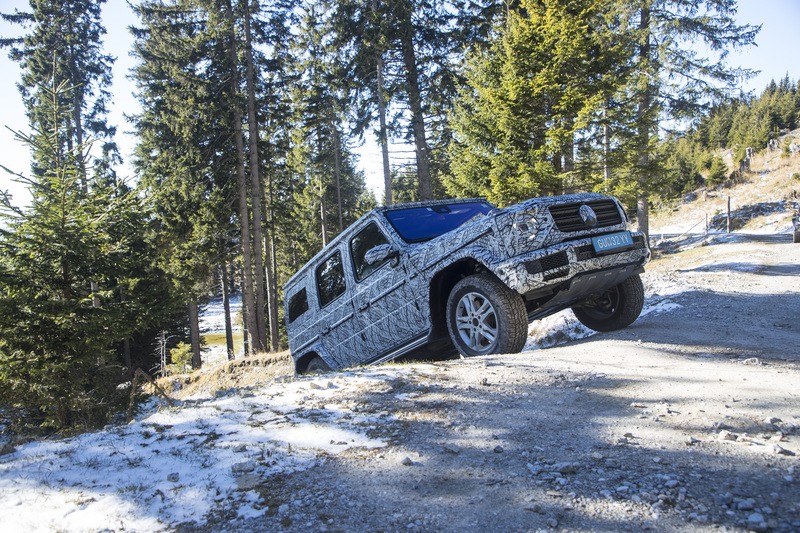 Its suspension is the result of collaboration between Mercedes-Benz G GmbH and Mercedes-AMG GmbH. The result is an independent suspension with double-wishbone front axle in combination with a rigid rear axle. During development work, the engineers had the task of fighting for every millimeter, because off-road capability also means maximum ground clearance. The raised axle with independent suspension decisively contributes to this, and additionally increases the stiffness of the body with a strut brace. The components of the double-wishbone front axle are directly fixed to the ladder-type frame without a suspension subframe. The attachment points on the frame of the lower wishbone in a Z-direction are positioned as high up as possible. This arrangement ensures good driveability beyond the asphalt. Specifically for the G-Class, the new front axle is designed in such a robust way that the off-road performance and off-road capabilities of its predecessor are maintained and even surpassed. The new rigid rear axle is guided with four longitudinal control arms on each side and a Panhard rod. The off-road vehicle stays on track more robustly, and is agile and effortless in off-road applications. The exceptional handling characteristics and driving safety on account of the driver’s high level of control can only be experienced firsthand. The following figures, however, clearly show that every little detail to improve the off-road characteristics has been checked and optimized where possible. One of the prerequisites for the improved off-road handling characteristics is the new “G-Mode”. The G-Class changes to “G-Mode” independently of the chosen drive program as soon as one of the three differential locks has been activated or LOW RANGE has been engaged. This off-road mode adapts the adjustable damping of the chassis and the steering as well as the accelerator characteristic, avoids unnecessary gearshifts and ensures maximum off-road capability. A small “G” icon discreetly lights up in the instrument cluster. The G simply swallows up major bumps, and even in extreme terrain the driver does not have to frantically hold on to the steering wheel to effortlessly maneuver. For power delivery, the 9G-TRONIC automatic transmission with torque converter was specifically adapted to meet the needs of the off-road icon. The developers have managed to reduce the shift and response times of the 9-speed transmission by means of a dedicated software application. The wide transmission ratio not only makes driving quieter and more comfortable especially at low engine speeds, it also simultaneously contributes to reducing fuel consumption. The low-range ratio can be engaged via the LOW RANGE switch (engaged when in transmission mode N) at speeds of up to 40 km/h. The gear ratio of the transfer case is then changed from 1.00 in HIGH RANGE to 2.93. It is possible to switch from LOW RANGE to HIGH RANGE at speeds of up to 70 km/h. The gear ratio of the transfer case is 2.93 and thus significantly shorter than in the predecessor model (2.1), which becomes noticeable particularly when pulling away on an extreme gradient. All-round visibility from a bird’s-eye view is possible thanks to the 360° camera, the reversing camera and three further cameras. This means that obstacles located below the window line or in front of the vehicle such as a hill crest do not remain hidden. The information is presented clearly in full HD in a choice of different views on the multimedia system’s display. Dynamic guide lines show the road and the width of the G-Class. In addition, the off-road screen specially designed for the G-Class also displays data such as height, gradient, angle, compass, steering angle and activated differential locks.